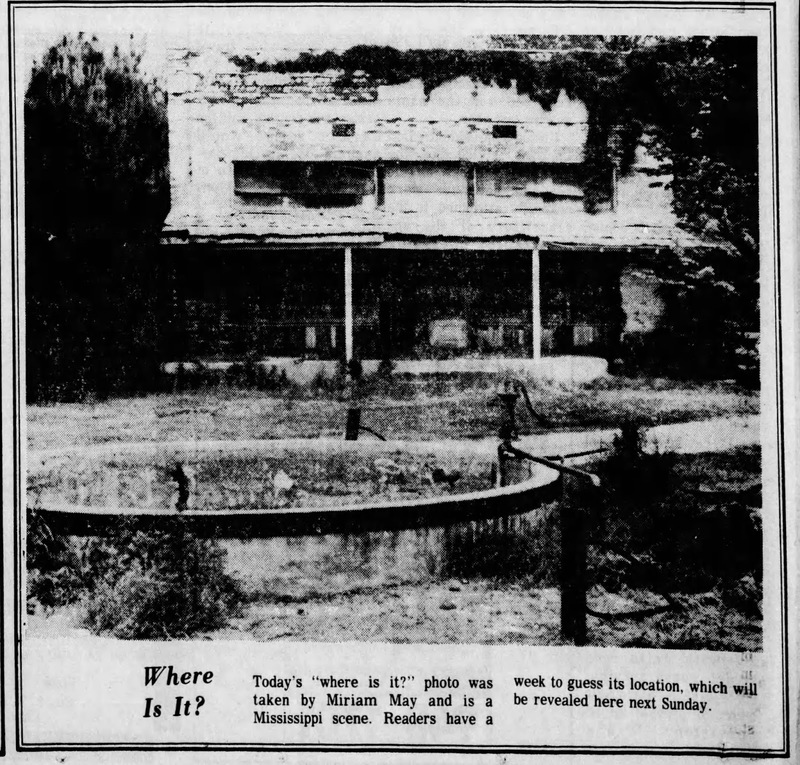 Jackson Clarion-Ledger, August 4, 1928. Sunflower county is a great county, a large county, has an enviable reputation in many ways, and the world has been attracted to it by the county in three successive years, having the healthiest girl in the union. 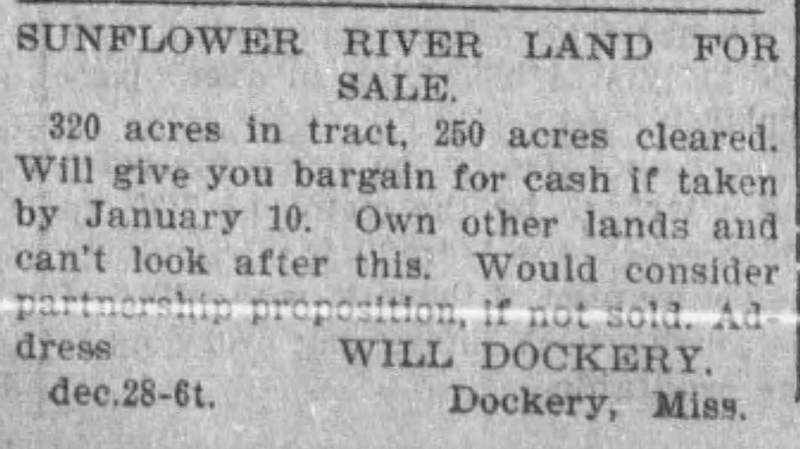 Besides this it has some of the greatest farms and some of the greatest farmers, and we invite the attention of the readers to the farm of Will Dockery, of Dockery. Sunflower county, Mississippi. Mr. Dockery is an ideal farmer, he knows how to farm, he knows how to make his farm pay a dividend. Go and see his farm; he will be glad to show you over it. There is not a man in the delta who has spent so much time in studying and trying to solve the problems of the delta planter. threats of revenge, and the store burned the same night. 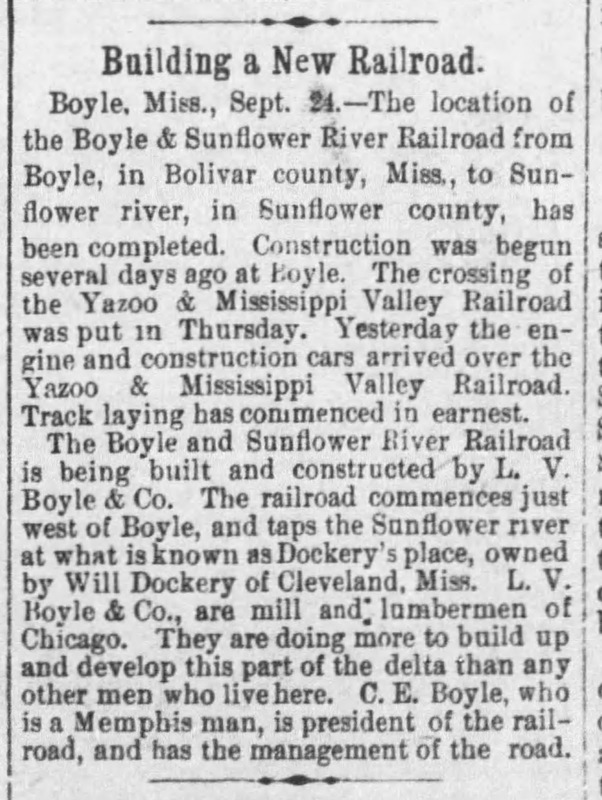 see the Clarion Ledger, Mar 10, 1892. H. A. Carpenter, County Farm Demonstration agent, in a local paper, said, "After you ride over the large 1 plantation and talk with him or his most efficient manager, Mr. Jett, you will see that they are much nearer to the solution of these farm problems than most farmers are." Mr. Dockery does not believe that, any planter or farmer can make a success of farming unless he grows all of his feed and you will notice on this farm there are several hundred acres of feed stuffs of corn, sagrain, soy beans, peas, clover, etc. He has several hundred acres of corn that will average around thirty-four bushels of corn per acre and his sagrain and soy beans are just as good or better than his corn. He has about two hundred head of hogs that have been raised mainly on mellilotus pasture that are now ready to be turned on his sagrain and soy beans. His cotton crop will average a bale or more to the acre according to the estimates of those who have been over his farm. On this farm, you can see what pure seed, fertilizers and the thick spacing amount to in the making of a profitable cotton crop. One hundred and thirty-five acres of this cotton is in check rows and has been worked with tractors. It is interesting to compare the cost of making this checked cotton to that planted and worked in the drill. A large number of farmers from all over the delta have visited this farm and I would like for groups of farmers from all over Sunflower county to go see it. "Delta Blues Grew up on Plantation"
1978 Review of "Good Mornin' Blues,"
a one-hour documentary broadcast on Mississippi ETV. DOCKERY — Back in the days when cotton was picked by hand and the old Peavine Railroad transported cotton and passengers, Joe Rice Dockery remembers seeing on his father's plantation. Black children always dancing in the tenant houses and hearing singing in the old Baptist Church for a mile or two. These were the days of the birth of country music blues in the Delta which has provided the basis for rhythm and blues, rock and roll, soul and much modern music. "The Charleston was a native step to the children. And all the [black folks] had music in them, there's no question," Dockery said. The Dockery plantation established in 1895 by Will Dockery off what is now Highway 8 just inside Sunflower County is the scene of part of the filming of "Good Mornin' Blues," a one-hour documentary broadcast on Mississippi ETV. The program, which is narrated by Mississippi-born B. B. King, has been accepted for national distribution by Public Broadcasting Service (PBS). King's narration was filmed at Dockery which is recognized as the home of many of the singers in the film. Others were filmed around Mississippi- where they live or work. 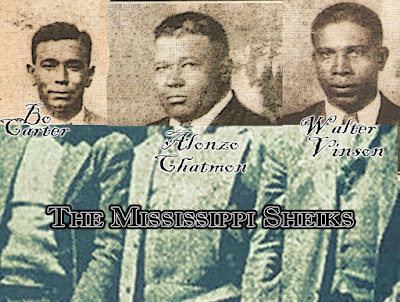 The program traces blues music from its earliest origins around the turn of the century until World War II. Featured is the music of 18 blues musicians. Dockery particularly remembers Charley Patton who lived on the farm for quite a while and whose cousin still lives in Cleveland. "He was quite a rounder as all blues people were," Dockery recalled. "Those kind were never steady farm workers. They'd much rather be singing at a party somewhere. They had no ambition other than to sing." 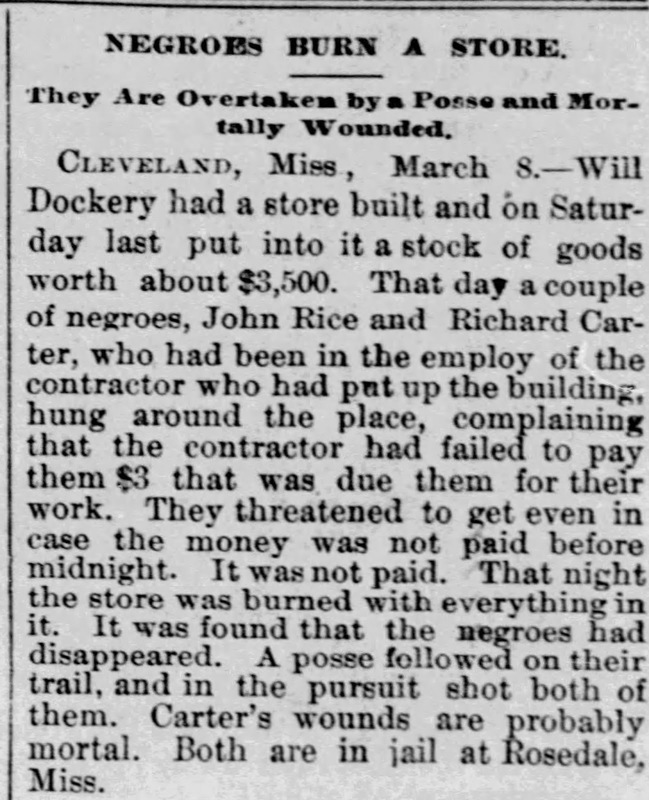 The Vicksburg Herald, Dec 28, 1902. A blues record sent to Dockery includes a Charley Patton song in which he sings, “They run me away from Will Dockery." Dockery grew up in a time when a man who acquired money sent his family to live in the hills away from the malaria-ridden swamps. 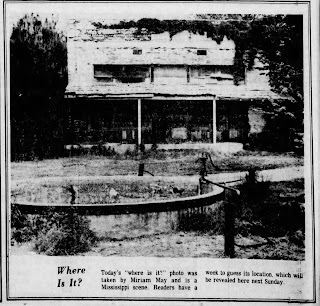 The Dockery children lived in Memphis and Joe Rice visited the Delta farm periodically. But the workers lived on the farm and they had no entertainment other than themselves. "They had fun among themselves with dances, picnics and such. Saturday night was a first-class brawl for a lot of them," Dockery said. "They were great crap-shooters. On Saturday afternoon there was a lot of drinking, gambling, cutting and scraping. But murder was always a crime of passion, not pre-meditated,” he continued. "Generally the plantation owner would get his men out of jail because he needed them," he said. 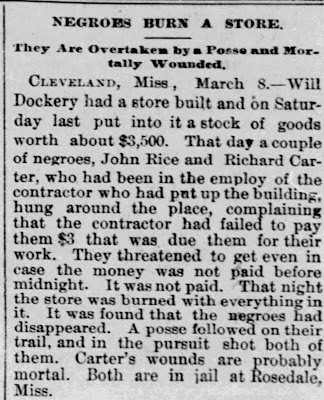 Dockery noted that his father took care of his workers providing a doctor to look after them and a non-profit burial society. Music, particularly the blues, seemed to be a natural evolvement of the lifestyle. "Blues occurred when a person lost a loved one, particularly when a [black] man lost his woman. That's all they had, that and religion," Dockery commented. "We used to have a big, brick store with five or six clerks, a post office and a tremendous railroad depot. 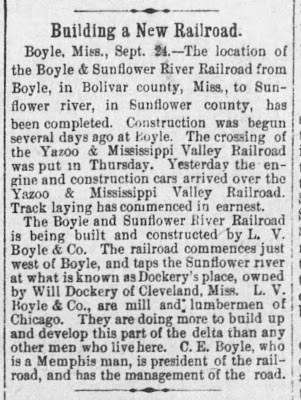 The train on the Peavine made up in Cleveland, went to Boyle and backed all the way to Dockery before going to Rosedale. Back then it had passenger cars," he recalled. But these all disappeared as farming became mechanized, trucks took over the railroad business, the labor went to town to shop and finally moved off to the city to live. But the blues music born in those times and surroundings has lived on. 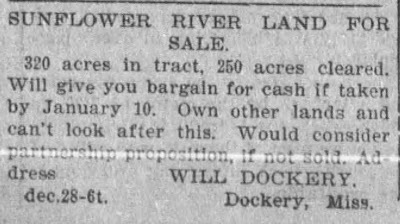 The lifestyle on the Dockery farms has changed greatly since Will Dockery bought up thousands of acres in Mississippi and Arkansas, clearing the timber for crops. Yet, in some very important ways, it remains the same.